Led by firecracker front woman Collette McLafferty, edibleRed is an eclectic New York City-based five-piece collective of atypical musicians. The memorable songs the band creates can be heard on their debut CD, Welcome to My Bad Behavior, slated for release in late May, 2007 on veteran indie label Select Records. Featured lyricist McLafferty is edibleRed's femme-fatale who describes her sound as one of "a classically trained voice that slowly degenerated into a rock singer's." It is fitting that having once performed for Jeff Buckley "before realizing who he was," she blends songwriting skills like Buckley's with the style and panache of Debbie Harry and a rich voice a la Tracy Bonham. Alongside McLafferty is edibleRed co-founding member, the Grammy nominated drummer Tom Papadatos. edibleRed is masterfully supported by the so-tasty-they-must-be-bad-for-you licks of cellist Dave Eggar. Known to some for his groundbreaking classical string quartet Flux, Eggar has toured extensively with some of rock's hottest acts. From an acoustic European tour with Evanescence, to performing with the Who at Carnegie Hall, to playing on recordings by artists as diverse as Breaking Benjamin and Nelly Furtado, Eggar is the prima fixe of edibleRed's menu. Lead guitarist Sean McMechen brings edibleRed's hard rock roots to the surface. After years performing in metal bands, McMechen graduated with a degree in Fine Arts and guitar from Jersey City College, and then continued his guitar study at Parsons College in Manhattan. The tight, crunchy rhythm section makes mouths water thanks to the delectable skills of bassist Marty Osterer and drummer Tom Papadatos. Osterer already has one #1 single under his belt - as the session bassist for Murder Inc. Records, he was featured on the Jennifer Lopez and Ja Rule smash "I'm Real." He has also laid down bass lines for LL Cool J and Kelly Price. Papadatos graduated with a performance degree from Berkelee College of Music in Boston and played with classical crossover artist Sasha Lazard at the CD release party for her recent "Myth of Red." Recently, Papadatos toured Indonesia and Singapore with New York blues guitarist Hugh Pool. Aside from being one of the most talked about bands in the tri-state area, edibleRed has been cultivating a diehard national following, and planting seeds internationally thanks to non-stop touring, and radio and TV appearances on FUSE TV's IMX and Brooklyn Radio Online. McLafferty was featured on an episode of FUSE's "Tattoo Stories," and The Style Network's "Split Ends" where she got a brand new coif from the scissors of a hot Los Angeles stylist. In February 2007, members of edibleRed were special guests on an episode of the Dr. Keith Ablow show where psychic twins predicted their imminent success. 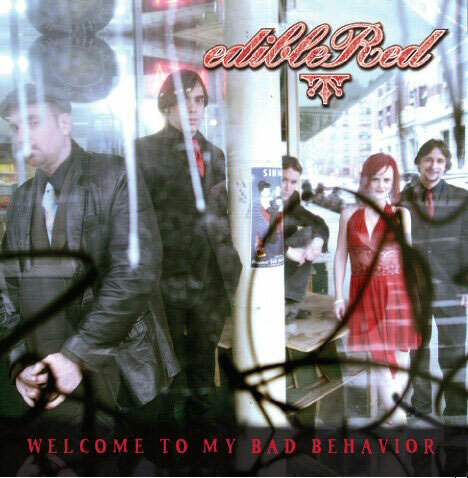 edibleRed's songs have been included on the Oxygen Network's "Good Girls Don't," and most recently the band's lead single "Sugar and Spring" was featured in an episode of Showtime's "The L Word." Their music can also be heard on KROCK2's "Domestic Disturbance." Bring all these ingredients together and you have a psychedelic rock recipe sure to satisfy any appetite.